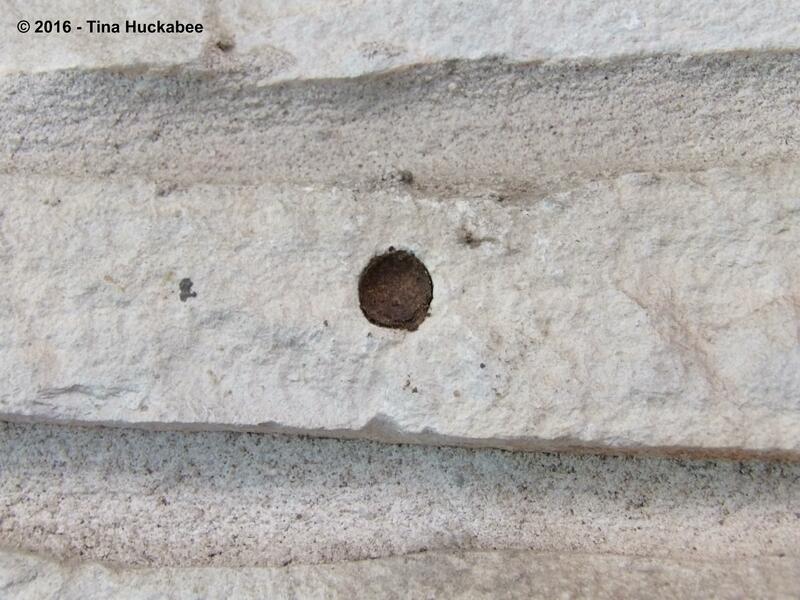 Hole originally drilled in limestone to hold a shelf on an outside wall of my home, but taken over by a native bee and packed with soil and pollen. Holes are a good thing. 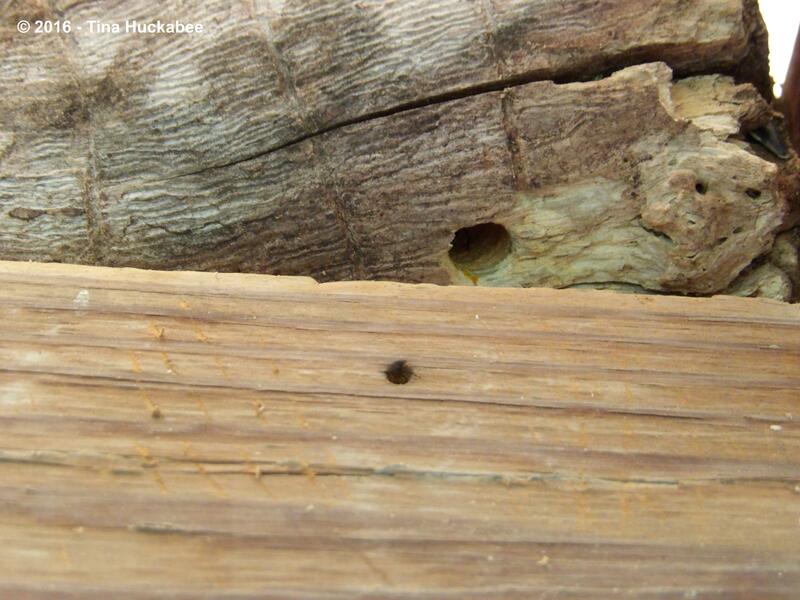 Holes drilled by a native bee in a log and also in the wood frame on my back patio. Holes in wood and masonry and bare ground and leaves suggest that pollinators are at work and planning for the next generation. 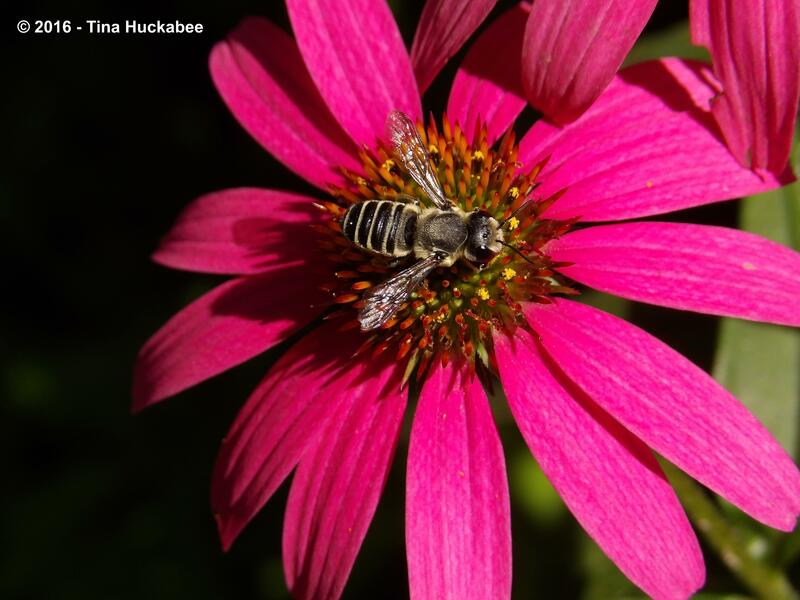 Continuing the celebration of National Pollinator Week, let’s talk about those critters making the round holes: let’s talk native, or wild bees. According to the U.S. Geological Survey on native bees, there are roughly 20,000 native bee species in the world, about 4,000 of which are endemic to the U.S. Native bees are found on every continent (except Antarctica) and are some of the most important, if unnoticed and unappreciated, of the hard-working pollinators. Many native bees are so tiny that you wouldn’t see them unless you’re really looking. Tiny miner bee on a Zexmenia (Wedelia acapulcensis). Other native bees, like this Horsefly-like Carpenter bee, Xylocopa tabaniformis, are larger. Horsefly-like carpenter bee on a Engelmann’s daisy (Engelmannia peristenia). Additionally, check out the holes on the petals–probably made by a leafcutter bee. Native bees are remarkably beautiful. 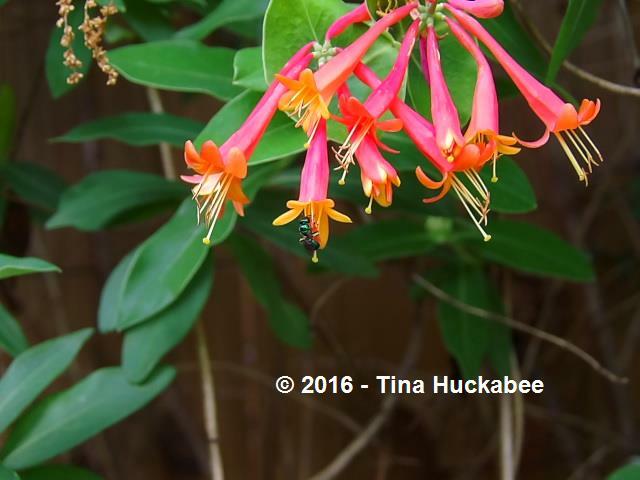 Colorful metallic sweat bee on a Coral honeysuckle (Lonicera sempervirens). Regardless of size or looks, native bees are the bomb when it comes to pollinating abilities. They are some of the best and most efficient pollinators you’ll ever want to invite into your garden. Not all native bees make holes in wood or leaves and petals for their nests, but they all need certain environmental qualities to live and thrive. We know that native bees are declining and some of the common reasons are as follows: reduction of habitat, pesticide use, lack of pollinator plants. How can you be a part of the solution to slow the native bee decline? Make your garden welcoming to these important creatures. Many native bees (like bumblebees) nest in the ground. You can allow a portion–it doesn’t have to be a large area–of your property to host some bare soil: no mulch, no cement, no hardscaping, no garden or turf of any sort. I keep a fenced-off work and storage area where my compost bin is located. It’s not mulched, though I’ve allowed some native plants to seed out. (I just can’t help myself.) 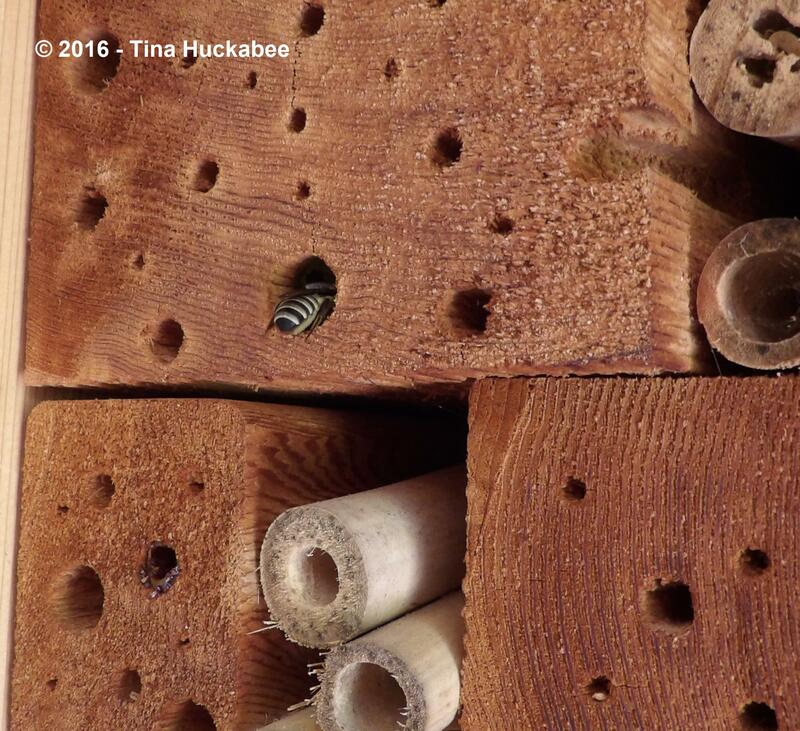 To some eyes, it’s “messy,” but to native bees’ eyes, it’s a welcoming neighborhood with good homes for their babies. And we all want good homes for our babies, right? A sterile, uber-clean look is not something that native bees like. While I haven’t spent much time searching the area for bees’ nests, I have noticed that my gardens host more native bees since I allowed this area some wildness. Many home gardeners are building native bee/insect hotels and that’s a fun way to help native bees find protected homes for their offspring. 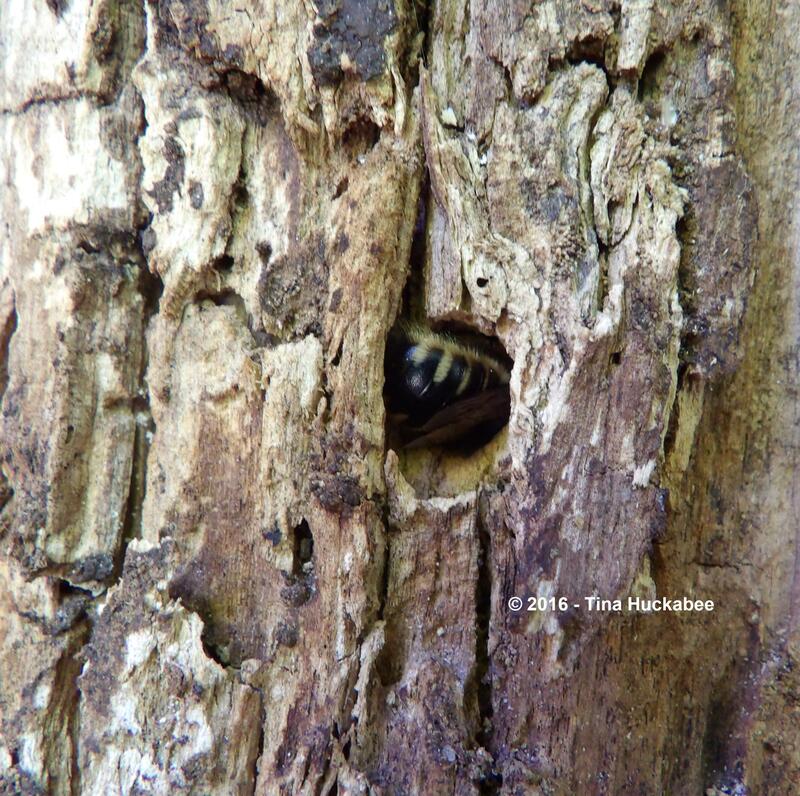 This leafcutter bee flew in and out of the hole over the course of several days. When she was done, she’d packed the hole holding her eggs with pollen, leaves and who knows what else. Her babies are safe and sound. Here’s the same bee type nectaring away on a Purple coneflower (Echinacea purpurea). I wrote about my insect hotels here, but there’s plenty of information available on the Internet or through garden resources about building insect hotels or houses. These are simple and fun projects to do with kids. One of the easiest things that will allow native bees to settle in to your garden is to leave firewood (that you won’t use) or downed tree limbs on your property. Certain species drill into wood and lay their eggs, so it’s a effortless way to ensure that they have a safe home for their bee babies. Horsefly-like carpenter bee working in her nest in a wood log. 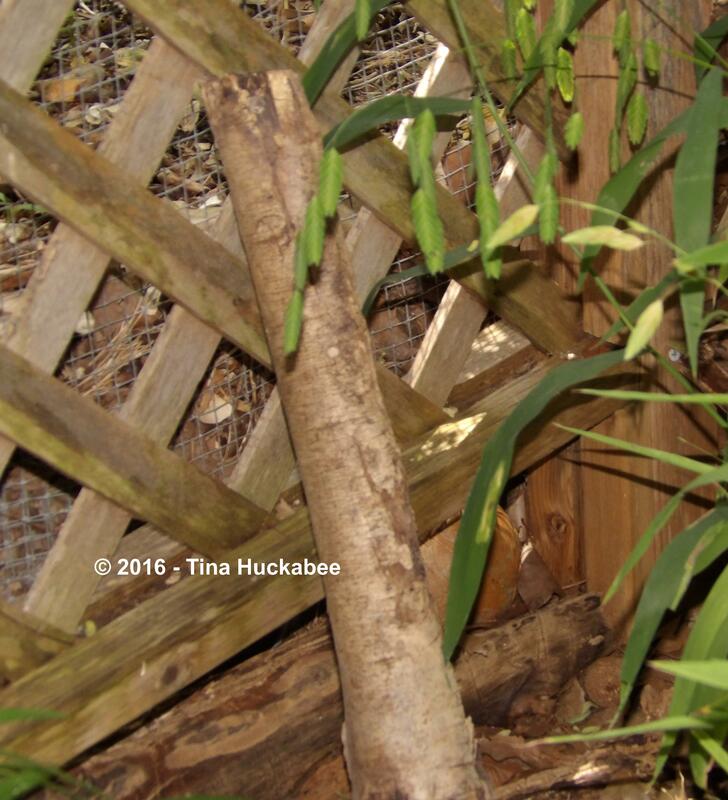 I’ve laid logs of wood in various spots around my garden; bees have no trouble finding the wood and getting to work making nice homes for their families. If you cut down a tree, keep some of the wood and maybe even the stump. 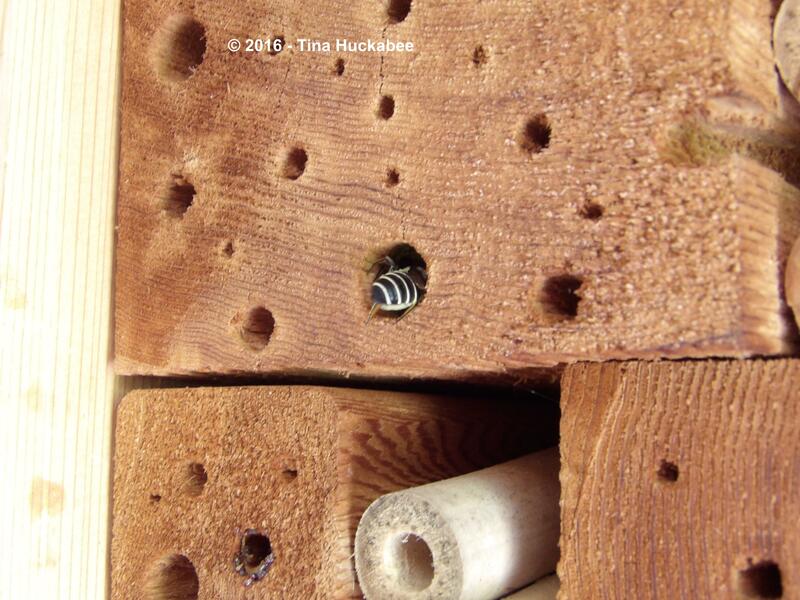 You can drill holes to give your native bees a head start, or leave them to it. Either way, it’s a win and native bees and your garden will be healthier for it . Another way to help slow the decline of native bees in your area is to refrain from pesticide use. 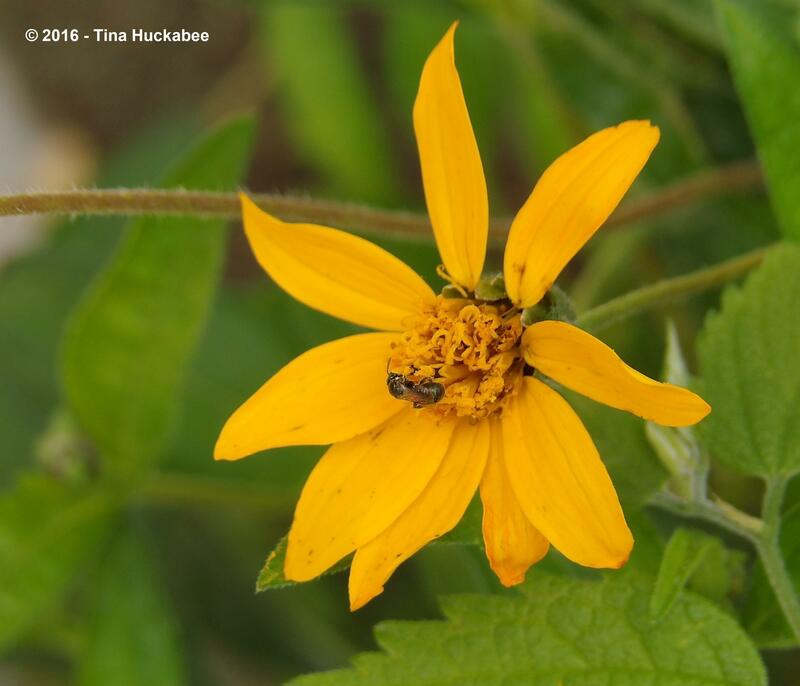 There are myriad reasons why home gardeners shouldn’t rely on pesticides, but allowing native bees to nectar and collect pollen, and to create those cool holes in leaves for their nests, are but a couple. Remember that pesticides kill–that’s their job. For example, if you’re spraying for adult mosquitoes, the pesticide will kill bees, butterflies, moths, and all other insects that the chemical comes in contact with. Pesticides don’t discriminate–they kill all “pests”, aka, insects. Plant for pollinators!! That’s the fun part. It’s best to use native bloomers if you can get them. 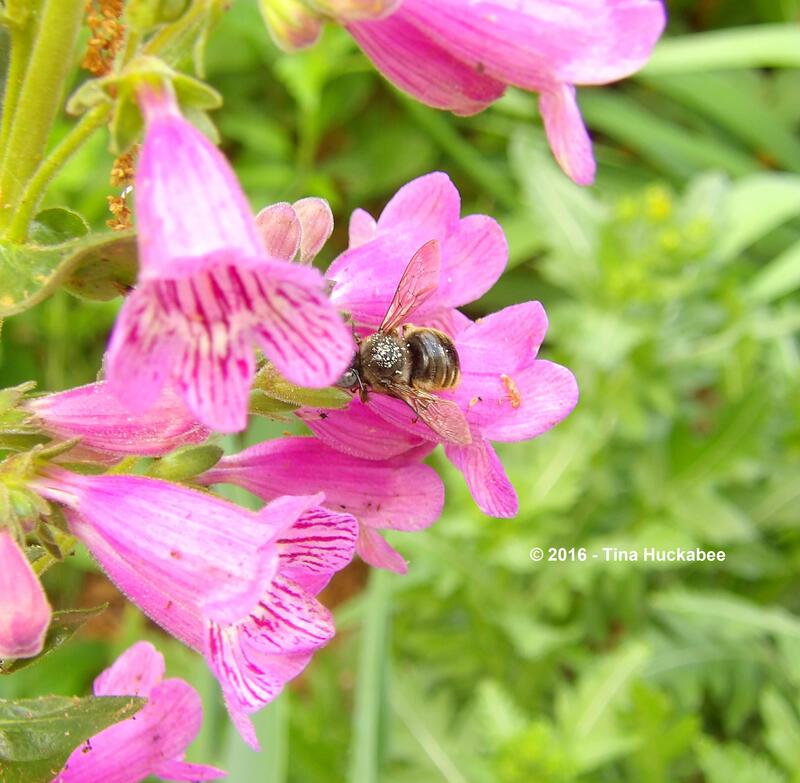 Horsefly-like carpenter bee working a Hill Country penstemon (Penstemon triflorus). 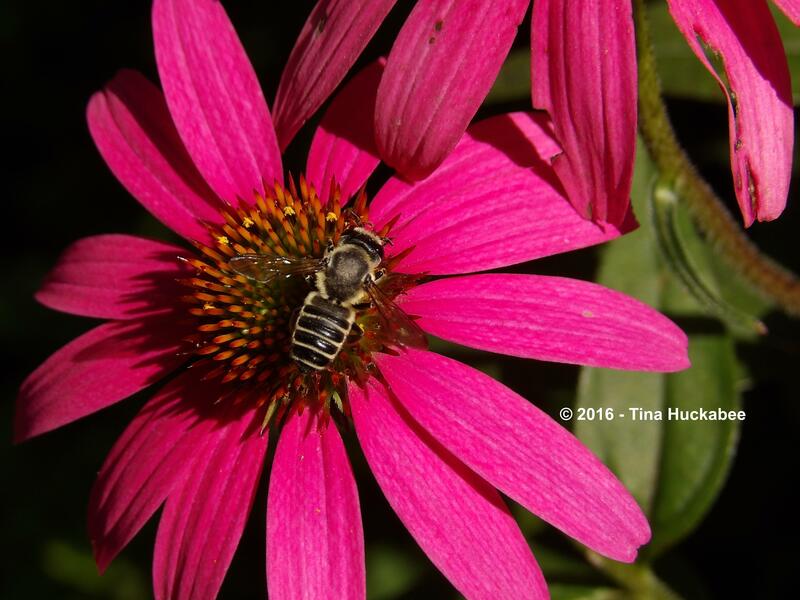 Leafcutter bee on a Purple coneflower. Mason bee (Osmia) (?) 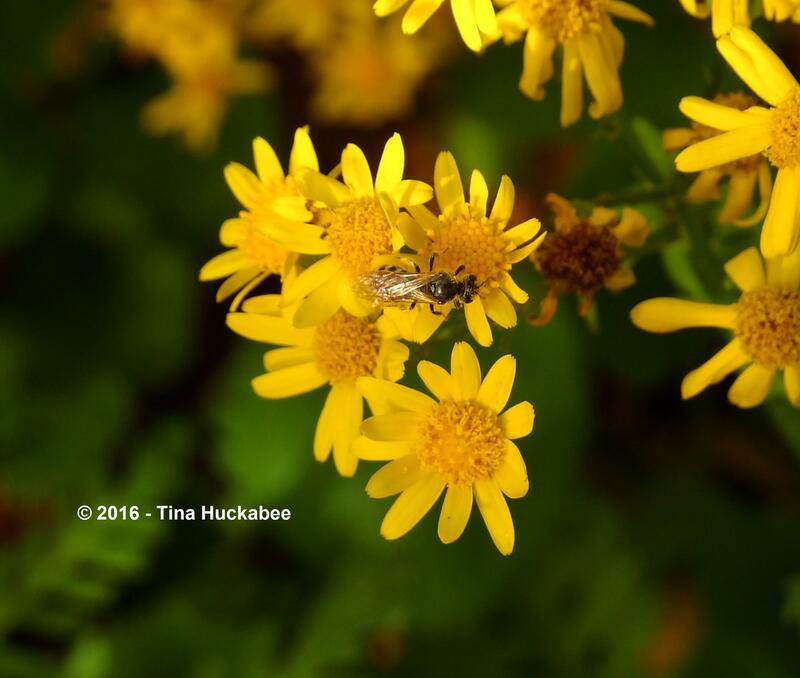 on Golden groundsel (Packera obovata). 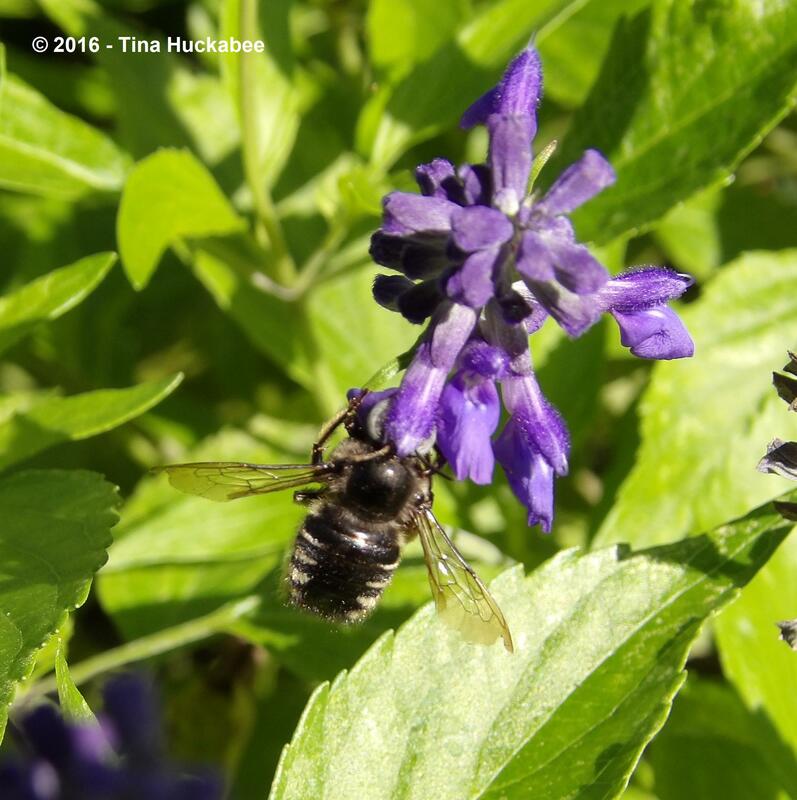 Horsefly-like carpenter bee on Henry Duelberg sage (Salvia farinacea ‘Henry Duelberg’). If native plants are not readily available, choose well-adapted, non-native perennials and annuals and have fun planting! 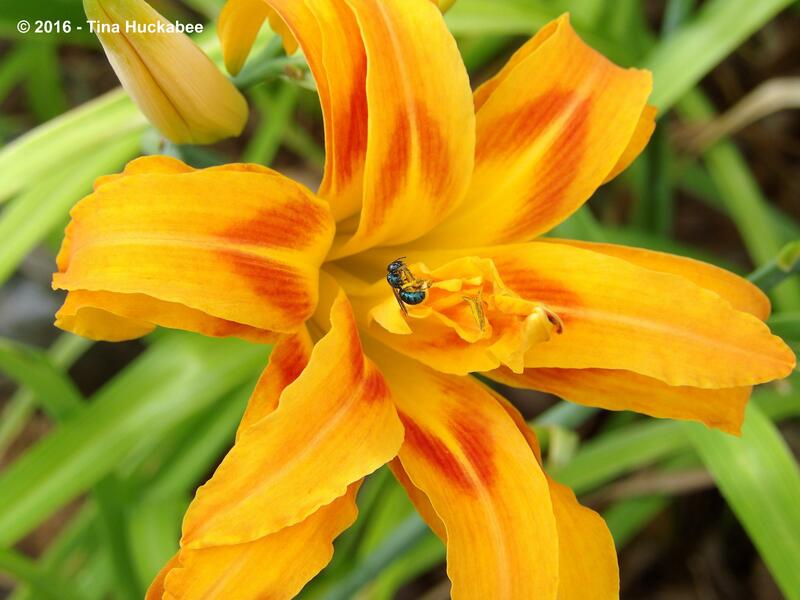 Metallic sweat bee on passalong daylily. Don’t forget that flowers bloom in seasons other than spring–plant for year-round flowering (even in winter if you live in a mild climate) so that pollinators are kept busy and happy. You’ll enjoy the beauty of the blossoms and the insects that visit and you’ll help repair the world in your own back yard. And front yard too! There was a field not far from our street, full of native wildflowers and grasses. Of course, it was going to be developed at some point and in fact, two new neighborhood streets with tidy little single family homes were built over the field. From a neighborhood perspective, it was the best possible outcome; certainly better than a hotel or yet another shopping center. But after the construction began, we never saw the bumbles again. I recently saw a giant black and yellow and fuzzy bumblebee in my back garden. I only saw her twice, didn’t get a good photo of her, but she was there, early two mornings, working the flowers. I have no idea where her home is. I can only hope there are more like her and that they have a safe ground home somewhere and plenty to survive on. Pollinators are life–they pollinate the food we eat, products we use, and they make the world a lovelier and more interesting place in which to live. Pollinators deserve our attention and respect; they deserve to live. 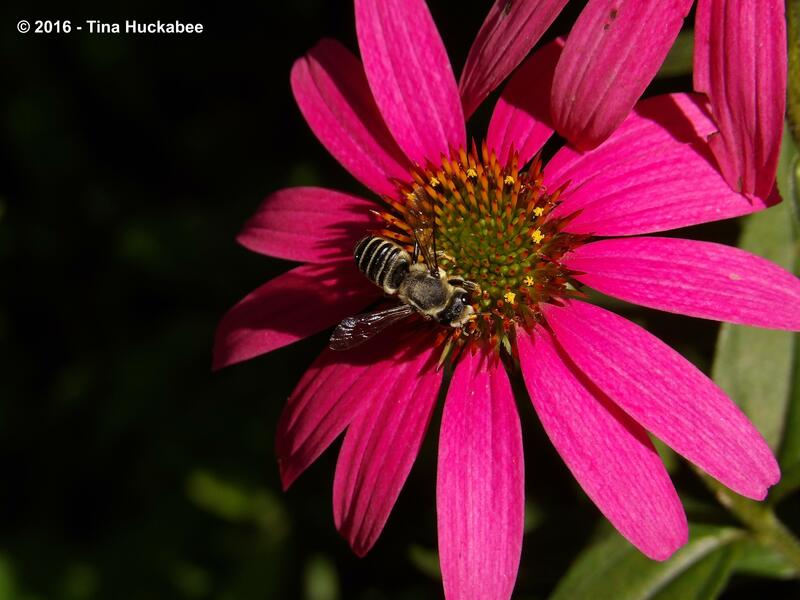 If you don’t have a pollinator garden, well, why not give it a whirl? It’s not hard to plant for pollinators–you’ll be amazed by their beauty and impressed with their work ethic. 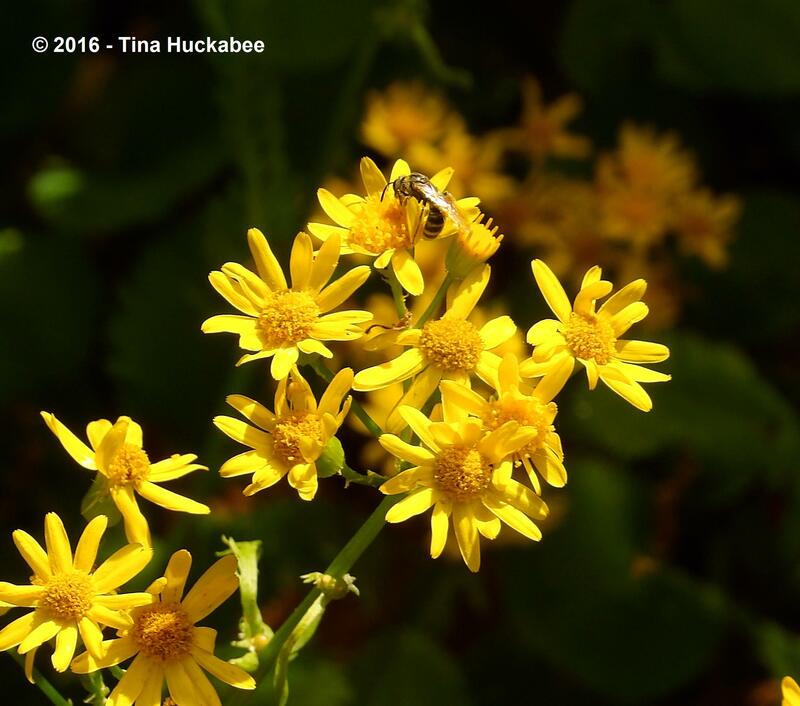 This entry was posted in Biodiversity, Native Bees, Pollinators, Uncategorized and tagged National Pollinator Week by Tina. Bookmark the permalink. Here’s a fascinating fact about leaf-cutter bees. I varnish the wood on boats, which often have a multitude of vents for various purposes. 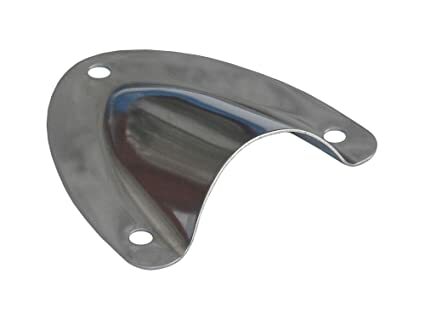 Some are quite small, and are covered by stainless clamshells like this. It’s quite common to see the leaf-cutters setting up shop in such places. The first time I saw one carrying its bit of leaf into a vent, I had no idea what I was looking at. Now, I see them all the time. They clearly have found yet another cozy place for themselves. Innovative, don’t you think? What a great story and yes, they are remarkable. Thanks for sharing! I’ve also had a couple of different bee species pack their pollen material in the screw holes of my electric leaf blower and trimmer that I leave on my back patio and use primarily during winter. I’d really like to place the equipment back into the garage, but I want the bee babies to exit in the outdoors, so on the back porch the equipment remains! You have a great knowledge of bees. I am going to use your blog as an identification resource. Gosh, I’m flattered, but I’m no expert. 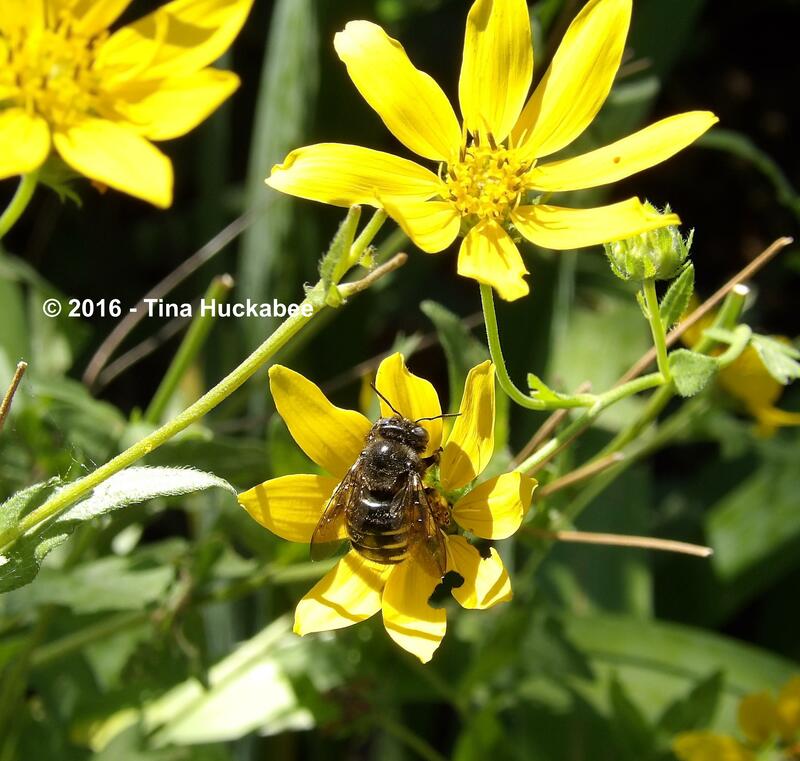 Mostly, I’ve observed and tried to identify and learn about what native bees need. They’re not picky, but the trend toward development and sterile landscapes is not helpful for their populations. I was tickled to actually witness a leaf cutter bee carefully snipping holes in a plant’s leaves the other day. It was the first time I’d ever seen more the results of their efforts. It was affirming of our choice to live with less than visually perfect/tidy garden beds to an extent that surprised me. I’m a sucker for the bees I guess! The ground dwelling bees here have accepted open spaces (if each space is several inches in diameter) in the midst of native plants for their homes, so I can have the best of both worlds. Open soil for the bees and the easiest reseeding of native annuals, along with some light cover above provided by perennial bloomers. Those spaces feed pollinators and the gardener’s eyes, all at the same time. 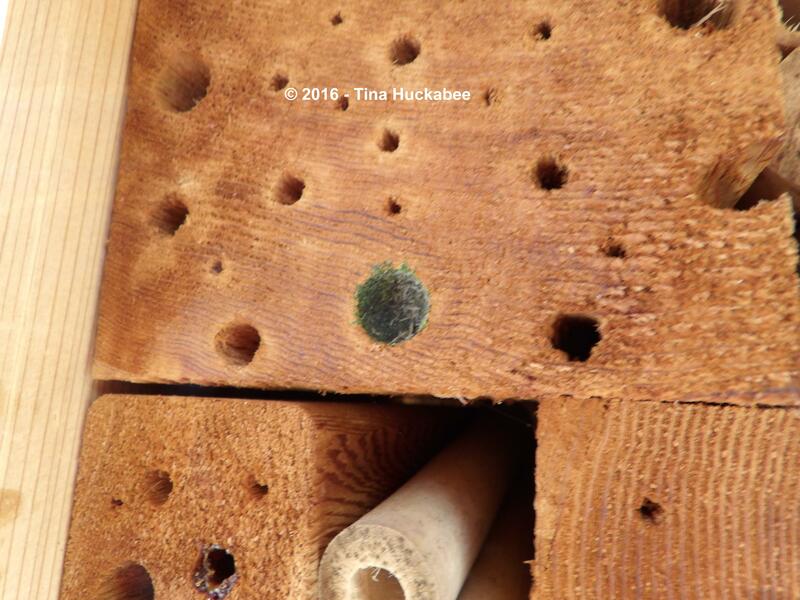 One last thing I’ll mention as addition to this wonderful primer on holes and bees… To be safe, any wood you use to attract pollinator homesteading must not have ever been treated with toxic substances to prevent rot or decay. That rules out most construction scraps, so exercise care with what recycled wood you choose! How fun that you observed mama bee and her powerful jaws!! I’ve only seen the results, not the action. Like you, I’m leaving open spaces and (I think) I’m observing more natives–it sure seems that way. Your warning about treated wood is a valuable reminder–there are really no chemical treatments that are particularly bee-friendly. Thanks for that. I read once that one of the reasons fireflies are declining (and there are many reasons) is that people have become too tidy. Brush piles, logs and some leaf litter may look a bit messy but they provide habitat. That’s a good point about having a continuous display of flowers. Tina precisamente estaba yo pensando en poner una casa para insectos. Ahora se que apilando un poco de leña en un lugar apartado del jardín ya tienen su casa. Quitar la hierba del suelo es muy difícil, pues es hierba del campo cortada lo que tengo como si fuera césped. Y es más bonita porque le salen pequeñas florecillas que no corto cuando paso el cortacésped. Perdón Tina pero esto está fuera de lugar. Muchas gracias por todo lo que me ha enseñado sobre los polinizadores. Las fotos son preciosas. Haré caso de sus recomendaciones y me pondré a trabajar. Mi jardín es ecológico. Nunca he utilizado ningún insecticida. Gracias Tina. Saludos de Margarita. Thanks, Margarita! I’m pleased that you’re so interested in pollinators and in building a house for them. Also, that you haven’t used any pesticides–that’s a very good thing, indeed!! Gracias a ti, Tina, por como nos enseñas cosas de la manera más clara y bella posible: a través de tus maravillosas fotografías que nos hacen cambiar de parecer y amar a los polinizadores. Saludos de Margarita. I agree! Wood and fallen leaves are the friends of gardens. They can be placed in more “controlled” areas, so as not to offend, but are necessary for a healthy environment. The bees that I have the best luck getting photos of are the Horsefly-like carpenter bees–they’re absolute hams for the camera. Excellent post with great photos. I have a crosscut slice of an old maple tree leaning against the silver maple. I keep looking for signs that critters are nesting in it, but I’ve seen nothing so far. I admire how observant you are, and the way you find all the bees’ nests. Thanks, Jason. Give it time, maybe your bees, etc. just haven’t yet discovered the gold in the wood. I don’t find all the bees nests, but they’re pretty common in my back garden, so easy to see. Great post! We put out a couple of insect hotels this year, but haven’t had any takers yet. I guess they are building nests somewhere though, because there are plenty of holes in our plant leaves.